The Cloud/AI Era greatly favors platform players – e.g. GOOGL, AMZN, MSFT, FB, AAPL, etc. – with first mover advantage, scale economies, network effects and control of rare skills that give them leverage to monetize their positions in multiple ways and significant barriers to new competitors. This market power has drawn scrutiny from world governments, who often see dominance within specific arenas of a larger competitive landscape as reason to intervene. Today, government action threatens to disrupt these businesses in 5 areas – 1. Antitrust, 2. Privacy/Data Responsibility, 3. Intellectual Property, 4. Business Constraints, and 5. Taxation – with the EU the most imminent threat, but future risk from all corners. 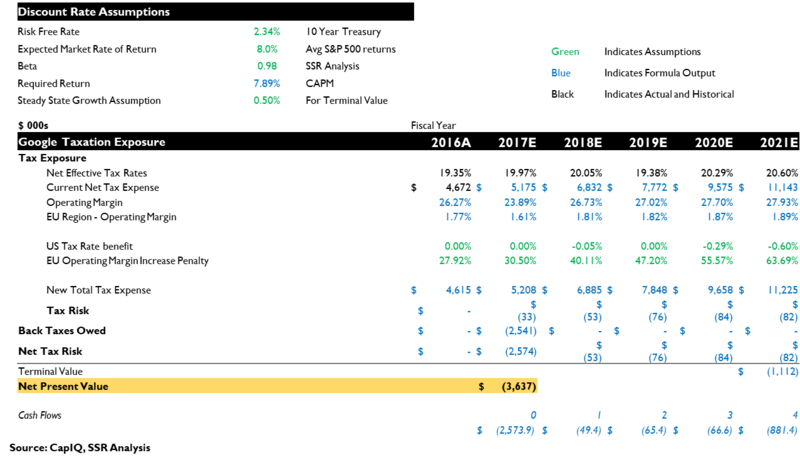 The EU has singled out GOOGL as its 1st target – we believe that most likely outcomes put its exposure at ~$14.8B in market value. FB (~$10B), AMZN (~2.1B), AAPL(~$3.4B), QCOM (~$7.9B) and MSFT(~$0.1B) also face significant government threats. In most cases, we believe that a fair assessment of risk is embedded in market caps, but worst-case scenarios – e.g. forced separation of integrated businesses, prohibitions against data collection, etc. – would yield significant downside for investors. The Cloud/AI Era favors big platforms. Our recent piece (http://www.ssrllc.com/publication/the-cloudai-era-a-perspective-on-the-next-decade-of-tmt-investing-2/) notes that the dynamics of Cloud/AI Era of TMT competition greatly favor dominant platform players, based on significant first mover advantages, major scale economies, network effects, and a scarcity of skills and experience. As such, GOOGL, AMZN, MSFT, FB, AAPL and a few others have been able to lever well-positioned franchises into new areas, while sustaining competitive barriers to protect their core businesses as they continue to grow. Left unchecked, these companies would primarily compete amongst themselves, with opportunities for smaller companies largely in service to the platform ecosystems. Governments fear big platforms. Concentration in the digital economy concerns governments, which fear platforms could block competitors from reaching customers, extract unjustified payments from 3rd parties, force bundling of products, misuse private information, exert undue influence on industry technical standards, or avoid taxation. Consideration of these issues will depend on how each company’s sphere of competition is defined – on a narrow basis, any digital franchise leader could be considered a monopoly, while at the broadest perspective, the top platforms compete vigorously with each other. The weapons of Government. Action toward TMT leaders has been in 5 areas. 1. Antitrust – Initiatives to punish and curb corporate actions deemed in violation of pro-competitive statutes, possibly asserting large financial penalties and required changes in business practices that could significantly affect sales and profits. 2. Privacy/Data Responsibility – Constraints on the use of personal information collected by digital businesses, and liability for the illegal use of platforms by users and advertisers. 3. Intellectual Property – Legislative and judicial challenges to the protections provided by certain categories of patents, and the terms under which they may be licensed. 4. Business Constraints – Regulations on business operations – e.g. net neutrality rules, local partner requirements, etc. 5. Taxation – Closing loopholes, asserting jurisdiction and punishing overly aggressive tax strategies. Aggressive EU could lead global action. The EU’s Commission for Competition is unusually powerful – it can issue binding rulings without trial – and focuses on competitors rather than consumer impact. Its aggressive treatment of GOOGL – a $2.7B fine, a demand to open its shopping service, and the risk that this specific finding might fuel more comprehensive (and expensive) actions. GOOGL is also likely a test case, with FB, AMZN and AAPL potentially at risk. A separate EU dictate on the use of consumer data due to take effect in 2018 is a further impediment, while investigations into favorable tax deals is another. Asian governments have been more focused on protecting local competitors and (in China) in tightly regulating the access of citizens to information. Currently, US regulators are sustaining a “hands-off” policy, but political winds could change dramatically for 2020. GOOGL most threatened, but others also at risk. 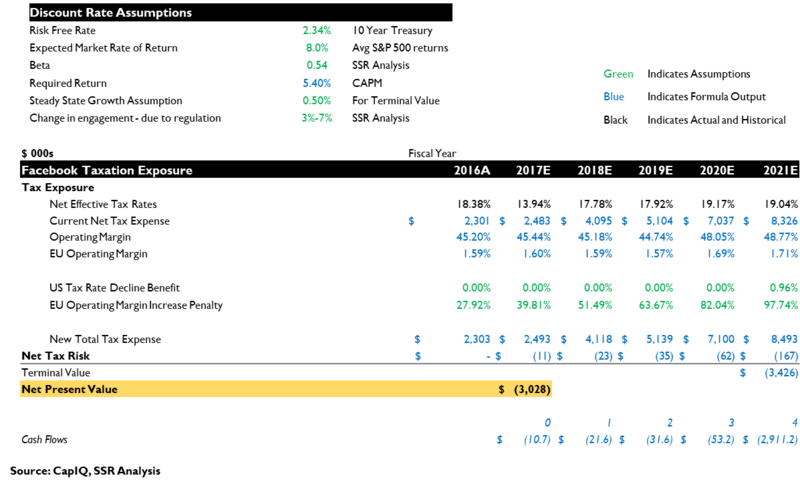 GOOGL has imminent antitrust and data responsibility issues to address – our most likely scenario prices these and other threats at ~$14.8B in market value. FB faces data responsibility issues and could see scrutiny of its dominant messaging franchise – likely cost ~$10B. 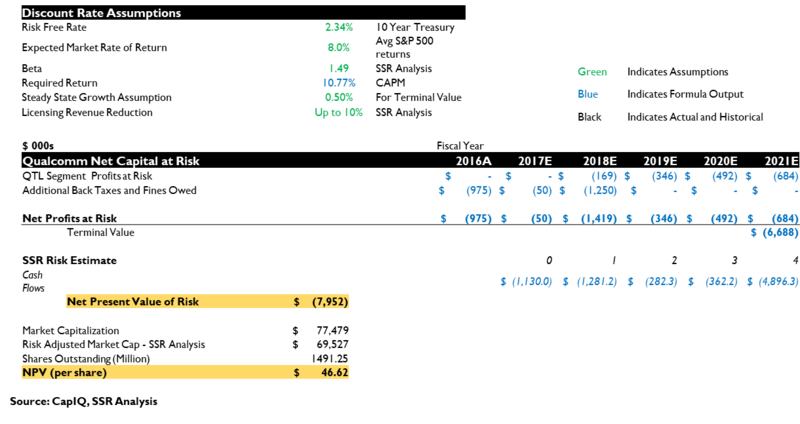 AMZN, still a small share of total retail, has not drawn as much attention, but could have significant future threats as it expands into new businesses – likely cost ~$2.1B. AAPL, with its extensive bundling and tight ecosystem control, has GOOGL’s Android to thank for its relative lack of government scrutiny. This could easily change – likely cost ~$3.4B. 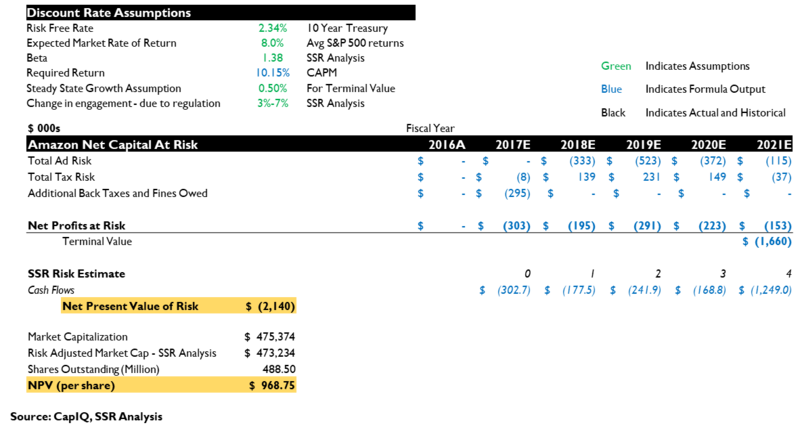 MSFT, with its history, is probably further down the list – we see the likely future cost at a relatively modest ~$0.1B. While we believe QCOM will favorably resolve its dispute with AAPL, long term average royalty rates are likely to settle closer to the deal recently negotiated in China. This is a ~$7.9B downside vs. historic rates but likely an upside vs. current market expectations. Most likely outcomes palatable to shareholders. Based on current political conditions, we believe that current market valuations largely reflect fair assessments of potential governmental actions, with GOOGL possibly facing modest downside risk and QCOM overburdened by investor concern. In this context, the companies best positioned to prosper from the Cloud/AI Era (GOOGL, AMZN, and MSFT) should retain the freedom to continue their leadership in competition with one another. Worst case scenarios near catastrophic. With a narrow focus, many Cloud/AI Era franchises could face government intervention, not just in the EU but possibly in an increasingly populist US as well. 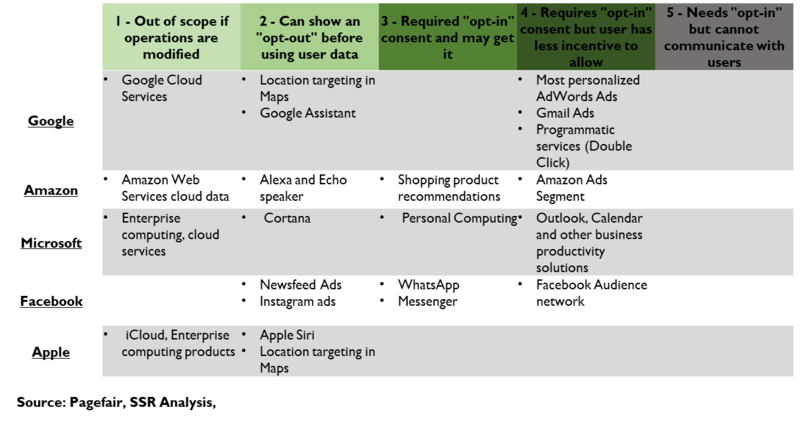 GOOGL, AMZN, MSFT, AAPL, QCOM, FB, and others could face curbs on their ability to collect and use customer data, on their control of 3rd party access to their platforms, and on their integration of functionality into their core platforms. Of these names, we believe MSFT is most likely to successfully weather such a scenario. Will remain a valuation overhang until investors have more certainty. Europe will be the test case for Cloud/AI regulation, with GOOGL in the crosshairs. Management must successfully navigate the antitrust challenge with an eye to forestalling any future action, while protecting the mechanics of its core franchise. Meanwhile, the EU privacy directive will carry real costs for GOOGL, FB and other platforms. QCOM faces another legal attack on its IP licensing model – this time by AAPL in the US. While we remain confident in QCOM’s position, the pressure on the stock will not abate until the matter is settled. We believe the likely costs of these threats are already embedded in GOOGL, FB and QCOM shares. The emerging Cloud/AI paradigm has the potential to profoundly change the way people and businesses use information (http://www.ssrllc.com/publication/the-cloudai-era-a-perspective-on-the-next-decade-of-tmt-investing-2/). A product of this change is the concentration of the market toward a handful of platform players able to exploit first mover advantage, scale economies, network effects and scarcity of skills and experience. While these companies – GOOGL, AMZN, FB, MSFT, and AAPL chief amongst them – have obviously contributed mightily to the well-being of consumers, the global political class has grown concerned for their power. The EU, with appointed commissioners wielding unusual power to mete out judgments and remedies without formal trial, has taken the lead, already finding GOOGL’s favorable placement of its Shopping service within search result to be a violation of antitrust laws. As GOOGL proposes remedies (while it appeals the decision in court), further investigations loom. It seems very likely that the EU Commissioner for Competition will turn her attention toward the other platform players as well. Thus far, the US and other developed world governments have far less aggressive positions, but political winds can shift quickly. Beyond antitrust and data responsibility, we see three other arenas of possible government intervention – intellectual property, industry specific regulation and taxation. Patent law has new attention in many jurisdictions, questioning the leverage of so-called “patent trolls”, the protocols for software patents, and the model for licensing standards essential patents. TMT companies face many regulations on their businesses, including “net neutrality”, state control of media, police access to user data, and other areas. Finally, the EU is moving to block interpretations of tax law that allow international firms to funnel sales and profits to lower rate jurisdictions. The negative effect of this is likely to be partly offset by a move to US rates. 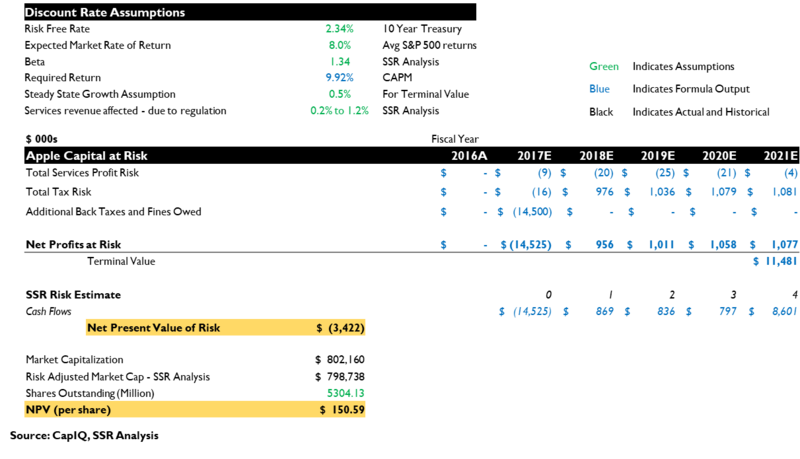 Looking at all threats of government action across global markets, GOOGL carries the biggest valuation risk – estimated at $14.8B for our most likely scenario. FB ($10B), AMZN ($2.1B) and QCOM ($7.9B) have the next largest exposure in the likely case, but all these players, plus AAPL and MSFT face material threats from a worst-case situation, which could block data collection and force disintegration of platform services across multiple jurisdictions. Still, we believe the likelihood of this remains very low given rising evidence of the competition amongst the platform players themselves. The cost of the most likely scenario should be palatable to investors relative to the opportunities being pursued by these companies, and may already be imbedded in expectations for the stocks. We recently published our detailed perspective on the timeline and implications of the Cloud/AI Era that we believe is profoundly changing the way that people and organizations use information. (http://www.ssrllc.com/publication/the-cloudai-era-a-perspective-on-the-next-decade-of-tmt-investing-2/) As this generational sea change continues to play out (Exhibit 1), we believe that there will be multi-trillion-dollar opportunities available to companies able to apply hyperscale computing resources and AI software techniques to massive data resources being generated from far reaching information networks. We have seen the disruption of the media, advertising, retail, consumer electronics and enterprise IT industries begin. We sense that disruption of other fields – transportation, financial services, healthcare, and others – could be imminent. As we review these opportunities, the same list of well-established cloud-based franchise players continue rising to the top. More so than previous technology eras, this one favors the already big and powerful, because of a combination of first mover advantages, scale economies, network effects and a scarcity of necessary technical resources. First Mover Advantages – Out of the scrum of the late ‘90’s dot.com bubble, a few franchises won the race to critical scale – typically because they were better than the alternatives but also because they were in the game early. Google established its powerful search franchise just as tens of millions of consumers were getting on line and setting their surfing habits. It then recognized YouTube as a similar early winner, and established its Maps initiative as a category killer as well. Facebook fought off Myspace and Friendster to gain an early lead that it has never relinquished. Amazon started in books and used its ferocious move to leadership in the category as its foothold for attacks on other retail categories. Its Prime program is another example of first mover advantage. Scale Economies – In 1996, Google founders Larry Page and Sergei Brin realized that the client/server datacenter architecture that was standard at the time would never be able to scale to a size necessary to index the entire internet, so they set about inventing a datacenter architecture that would. The resulting approach to computing infrastructure has economies at all turns – lower hardware costs, lower power costs, lower personnel costs, higher capacity utilization, lower real estate costs, etc. – driving market leaders to build ever larger networks of interconnected hyperscale datacenters. We believe that Google’s computing costs may be less than 10% of the average enterprise datacenter, a gap that has been widening. Amazon, Microsoft and Facebook are following, but smaller competitors cannot. Another major scale economy plays in AI, where much larger datasets produce much more robust solutions than smaller ones. Combined with those powerful datacenters, scale gives the big platforms enormous advantage. Network Effects – Cloud services are characteristically more powerful as more people use them, often better on a geometric basis. Facebook users become ever stickier as participation amongst one’s circle of acquaintances become ever closer to ubiquity. Amazon’s user recommendations become more valuable with a larger universe of reviewers. Technical standards are as strong as the unanimity behind their adoption. Once an internet franchise is well established, these connections amongst users make it very difficult for newcomers to break in, even with a superior solution. Resource Scarcity – In AI, the scarce resources are talent and data. Complicated deep learning models take years to build and train – the time will go faster and the results will be better if a company can devote more expertise and access better datasets. In the Cloud/AI Era, scientific talent is highly concentrated – Google, Microsoft, IBM and Facebook have built substantial brain trusts, hiring away top minds from the world’s universities and, in doing so, constraining the supply of new Ph.Ds from those institutions. Amazon joined the chase a couple of years ago, with Apple following last year. Until the scarcity eases, it will be difficult for newcomers to play at the highest level. As for datasets, the big consumer platforms all have substantial franchise businesses that generate valuable data – although Apple is alone in refusing to collect most of it. Non-digital-native businesses, like banks, health care providers or industrial companies, may have substantial amounts of data, but typically, they have not organized it in a way that is immediately useful for AI. Advantage again for the platform players. Governments have been chasing monopolies for more than a century. 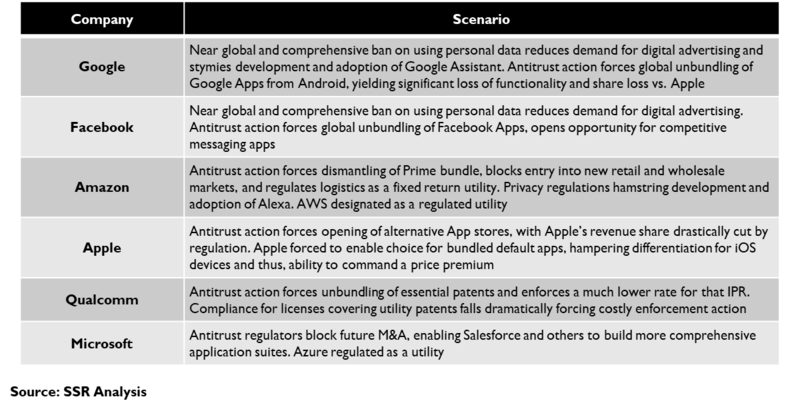 Recently, European antitrust officials have turned their focus to the dominant US-based platforms at the core of the Cloud/AI paradigm (Exhibit 2). US antitrust law is squarely focused on consumers, assessing whether corporate behavior is directly harming users through higher prices and/or lower quality. The European approach presumes that market power will eventually hurt consumers and acts against business activity that hurts competitors, even when an effect on consumers is not evident. Thus, a company like Facebook, whose products are entirely free for consumers, would not face antitrust scrutiny in the US for its dominance of social media, but could be interdicted by EU law if it were deemed to have unfairly exercised its market power to the detriment of an alternative service (Exhibit 3). There is another significant difference between EU and US antitrust policy. In the US, the DoJ must bring formal charges of anticompetitive behavior against a company in a judicial court. In Europe, a commission of appointed politicians can launch investigations and mete out punitive fines and demand remedies against companies it deems as violating EU antitrust regulations without a trial. While these findings are then subject to judicial appeal, the process gives the Commission for Competition, now led by Danish politician Margarethe Vestager, unusual power to intervene in the workings of businesses and markets. Of late, Vestager has had Google in her crosshairs. In June 2017, the EU announced that it had fined Google 2.42B Euros ($2.7B) for abusing its market power in internet search by favoring its own comparison shopping service over alternatives (Exhibit 4). The initial complaint, by European on-line shopping service Foundem, objected to Google providing a row of paid listings from its own Shopping service at the top of results for searches on specific product names. Google’s defense, that these ads were of great convenience to consumers who could compare and buy with a single click from the results page and that this convenience was critical to competing with direct shopping apps like Amazon and Ebay, did not sway the commission. Pending appeal, Google is left to devise its own remedy which will then be evaluated by the commission. Recently, it announced that it would separate its Shopping business into a separate unit, which then would bid for ad space at the top of the search results alongside potential rivals. Based on comments from EU legal experts, it seems that it is likely that Google’s remedy, perhaps modified with further safeguards to assure competitive access to the ad slots, will prove acceptable. This could prove a pyrrhic victory for the small European product comparison services if, as we suspect, Amazon and other bigger non-European shopping services, like eBay and Alibaba, step in to dominate those ad slots and Google’s ad business might not feel much impact. Still, it remains a possibility that the commission could reject Google’s approach and demand something much more painful, or, on the flip side, that EU courts could reverse some aspects of the commission’s findings on appeal. The biggest risk may be for findings yet to come. The commission has already launched an investigation into Google’s Android business, which it accuses of abusing market power to force OEM’s to bundle Google applications, like Search, Maps, YouTube and Chrome, with the OS. This is obviously reminiscent of Microsoft’s late ‘90’s antitrust battle that led to it severing its Internet Explorer browser from Windows. On further consideration, the analogy breaks down a bit – Android has considerable competition in the premium segment from the iPhone and has struggled with relative criticism of OS fragmentation and core application integration. Moreover, the Android OS is free to OEMs and consumers – the bundling of moneymaking apps like Search, Maps and YouTube could be just compensation for Google’s development investment. Most expert observers expect the EU to hit Google with a fine even greater than the it did for the Shopping situation and to demand that it no longer bundle the apps with its Android licenses. The remedy might not be directly costly – most OEMs will still bundle the Google apps, which are wildly popular with consumers – but it could play havoc as the company moves to position its AI powered Google Assistant as a primary user interface. Finally, the decision on the “Shopping” search vertical could presage moves against other vertical areas like travel or entertainment. Broadly blocking Google’s ability to monetize search through actionable, ad driven results both negates its ability to use its data advantage in steering customers to appropriate partners, but potentially erodes value from AI assistants, which will likely make many choices on a consumer’s behalf. Imagine if Amazon’s Alexa were required to offer choices of both Amazon and non-Amazon sourced items when asked to make a purchase. Not only would it disrupt Amazon’s hegemony with Echo owners, but it would also degrade the service being offered to its customers. The implications for Google are the same. It is unlikely that Google will be the EU’s only target for antitrust action. Qualcomm is also under investigation for alleged bundling of IPR licenses with its chips. Facebook could be vulnerable for its integration of Messenger, WhatsApp and Instagram to its platform – imagine requiring Facebook to open user friend lists to alternative messaging platforms. Amazon is pushing aggressively into Europe – the EU could block Prime as anticompetitive. Apple’s bundling of internally developed apps, its tight control of the iOS App Store, and its closed architecture for peripherals could be open to scrutiny once the EU is done with Android. Nonetheless, we expect the EU’s fervor for antitrust actions against dominant cloud franchises will be tempered with time, as the fierce competition amongst the major platforms becomes a clearer story. For example, a strong Google Shopping platform might be the most potent competitor for Amazon’s powerful retail franchise, just as Google’s Android is the only check on Apple’s iOS dominance (and vice versa). Moreover, Europe’s highest court recently ruled that lower courts must revisit Intel’s arguments on appeal versus a $1.3B fine issued against it in 2009 – a ruling widely viewed as a constraint on the power of the EU Commission for Competition. As such, we are not projecting major industry fines or disruptive competitive remedies for anticompetitive activity beyond the Google investigations that we have discussed. We also do not anticipate EU-style activism against major Cloud/AI platforms in other jurisdictions. China has already effectively blocked Google, Facebook and Amazon from its markets – any change would likely be positive for these companies. The US would seem to be a haven for its home-grown heroes, but stranger things have happened in politics – the 2020 election could be as much of a surprise as 2016. A worst-case scenario would see the US joining the EU in enforcing the disintegration of the major platform players – a scenario that we believe would set back progress for consumers as much as for the presumed dominant companies. The EU also has the most stringent regulations on data privacy. In 2018, it will begin enforcing its General Data Protection Regulation (GDPR) which sets strict limitations on when data from consumers can be captured by on-line entities and how it may be used (Exhibit 5). Essentially, demographic and usage information cannot be used to target services and advertising to users without affirmative consent. Users will have to “opt in” to receiving targeted ads, a major blow to Google, Facebook and others, which charge premiums for ads targeted in this manner and expect to see higher click through for the ads (Exhibit 6). Platforms will still be able to target ads by geography, by association with other content requested by the user, and other means. With time, we expect Facebook and Google to minimize this impact by finding innovative ways to improve the effectiveness of digital adverting without personal targeting, and to induce users to agree to affirmative consent on data collection and ad targeting. Indeed, many other digital ad platforms, which push ads to 3rd parties, may find compliance with the new regulations far more onerous without the end-to-end ownership of the transaction and direct relationships with the consumer that Google and Facebook have. relationships with users that will give those systems considerable power to guide commercial relationships and steer information to consumers based on context and inferred preference. This will certainly require explicit consent in Europe, but could represent a “legitimate purpose” for collecting and using the data for the user’s benefit, as demanded by the GDPR. In our perspective, the cost of privacy will dissipate with time as the platforms get better at managing user data and as the benefits of allowing more liberal use become more apparent to consumers and politicians. Of course, Apple, with its somewhat self-serving commitment to holding personal user data private on the device itself, would benefit greatly if the privacy pendulum continues to swing away from the free use of consumer information. Its device-centered view of AI assistants, augmented reality applications, digital payments, and other functions relative to the cloud-centered perspective of its competitors would prove farsighted indeed. We see this as a plausible, but highly unlikely, scenario relative to the Cloud/AI future that we have postulated, one entirely dependent on aggressive government actions. Historically, the idea of intellectual property was a simple mechanism intended to promote R&D investment by giving innovators exclusive rights to monetize their inventions for a period long enough to reward them for their effort and risk taking. However, over the last few decades the world of patents has grown much more complicated. The US Patent Office granted nearly 3 million patents in 2016, a workload that leaves many industry participants concerned for inadequate scrutiny of applications for prior art, obviousness, or other shortcomings that ought to have invalidated their claims. Furthermore, many question a system that grants patents for concepts under the same terms as specific designs. Moreover, unlike pharmaceuticals, where testing may take many years post patent application, the world of electronics moves quickly and some question the appropriateness of 17-year patent lives that often stifle new minds from expanding on older ideas. A main concern for tech companies is the phenomenon of “Patent Trolls”. These are companies that build portfolios of patents, often buying or licensing them from individual inventors, and then search for companies that could be accused of violating these patents and demanding compensation. Often, these patents have questionable validity, but the costs of litigating to invalidate their claims can be high and the trolls typically sue in jurisdictions known to be friendly to plaintiffs. It can be easier and cheaper to pay the troll than to fight to the end. This is a key issue for the tech lobby. Standards essential patents are receiving unusual scrutiny these days. In many corners of the TMT landscape, companies rely on technical standards agreed to within the aegis of industry bodies composed of engineers and scientists from companies and universities. Participants in these forums must agree to license any intellectual property that is essential to compliance with these technical standards at “Fair, Reasonable and Non-discriminatory” rates, often shortened to FRAND. Over many years, these words have gained specific meaning in law, which largely relies on the precedent established through previous licenses to judge the legitimacy of new royalty demands. This has been the basis for decades of complaints against Qualcomm. 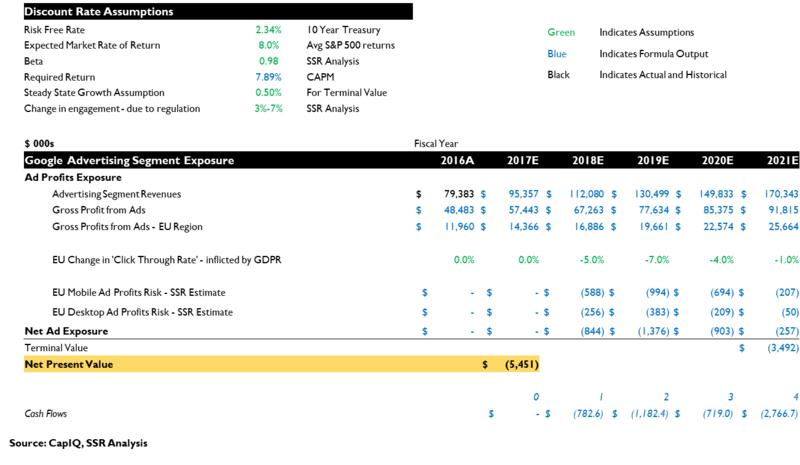 While the typical practice amongst patent licensors had been to group patents by type into specific bundles to license separately, Qualcomm decided to negotiated licenses covering its entire portfolio, including both essential and non-essential patents, for a single royalty rate. The purpose was to forestall future patent disputes with licensees that might pay for essential patents but not for so called “utility” patents that are not essential but that greatly improve the quality of a standards compliant solution. This policy was instituted in 1994 and has built many years of legal precedent, surviving major challenges from Motorola and Broadcom in the US, Ericsson and Nokia in the EU, Samsung in South Korea, and the Chinese government with its basic structure intact. We believe that it would take legislation to invalidate Qualcomm’s IPR program in any of the world’s major markets and do not see the impetus for such action. As such, we do not believe that the Apple led move to once again challenge Qualcomm in both the US and South Korea are likely to reverse precedent and expect the companies to eventually resolve the dispute through negotiation that should establish stable terms for Apple license the IPR. In 2016, the EU Commission for Competition announced its finding that a sweetheart deal between Apple and the Government of Ireland had resulted in more than $14B in tax underpayments on profits earned in Europe over the previous decade. The rough methodology – Apple transferred certain IPR assets to a shell entity in Ireland and subsequently charged its sales entity royalties due to the shell entity that reduced its taxable profits by more than 90%. The EU asserts that the assignment of profits to these shell companies is improper and that the royalty payments charged are inflated. Just this past week, the EU accused Amazon of creating a similar structure in Luxemburg, thus avoiding nearly $295M in taxes of its own. Both companies have strongly objected to the findings and have asserted that their arrangements with the EU member states adhere to the appropriate EU tax laws. Apple has already begun its appeal process, which could take years to complete in European courts. Amazon, which restructured their European operations in 2014 for logistics reasons and now pays taxes in multiple countries at what appears to be typical rates, has not decided whether to appeal. Many major US tech companies have cut similar deals with European countries – including Microsoft, Google and Facebook, which each have holding companies headquartered in Ireland. In each case, the reported profitability of European sales appears relatively muted and the tax rate on reported profits seems unusually low relative to European headquartered companies that do not make use of such structures. 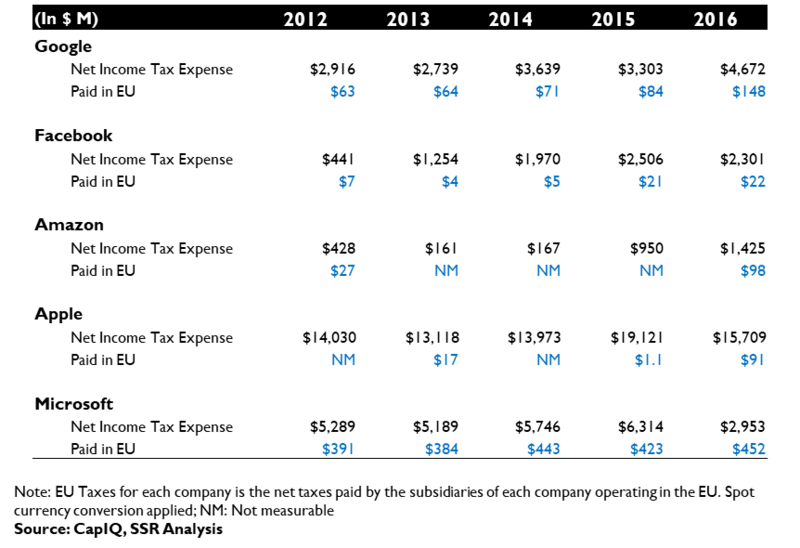 We also note that the US IRS has claimed that these organization structures have also lead to these companies understating their American tax liabilities – the value of IPR assets transferred to the European shell companies may be vastly understated relative, while royalties on US sales are paid back at inflated rates (Exhibit 8, 9). It is difficult to predict the final cost of these disputes, which will depend on political as well as legal outcomes across jurisdictions. We expect that a strengthening central EU authority will crack down on sweetheart tax deals offered by its member states to attract foreign firms to set up shop. However, we also expect that corporate tax reform in the US could partly offset the impact of higher rates in Europe. Net Neutrality – Under the Obama administration, the FCC took up the banner of internet companies concerned that a lack of competition amongst broadband and wireless carriers gave those operators undue market power. Cable operators had been accused of throttling performance for specific internet sites and favoring their own streaming services by excluding them from usage caps. Wireless carriers have also utilized cap exemptions, a practice called Zero Rating, to favor some services over others. While a 2015 decision to reclassify internet access as a regulated telecommunications service under the regulations of the telecom act of 1996 gave the FCC power to regulate these and other practices, it seems likely that Trump administration and Republican congress will work to reverse these policy changes in favor of the cable and wireless companies. 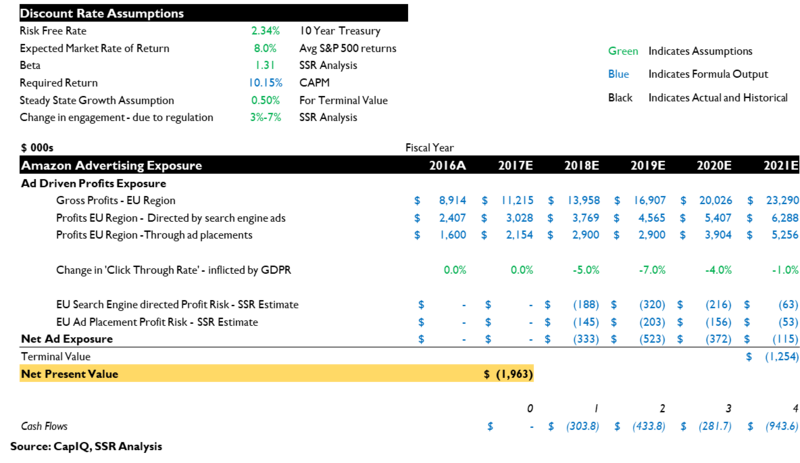 Merger Approvals – Thus far, it appears that the Trump administration is more amenable to consolidation than its predecessor. Still, apparent general animosity toward Silicon Valley and a populist backlash against big tech firms could temper the tendency toward laissez-faire. For deals with international implications, the EU, with its antitrust zeal toward American tech firms, would seem an implacable obstacle for major TMT deals. Closed Markets- In countries like China, laws may greatly favor indigenous competitors, restricting or even outright prohibiting foreign competition without local partners. Political leadership may also place censorship and state access requirements that are not palatable to international platforms. Companies like Google, Facebook and Amazon do very little business in China, but continue to explore ways in which they might penetrate this huge potential market. Other Regulatory Barriers – Opportunities in heavily regulated industries, such as transportation, financial services and healthcare, may be difficult for Cloud/AI platforms to address without changes in regulations at multiple layers of government. For example, autonomous robo-taxis would need franchise licenses in each municipality in which they operate, along with state and federal approvals for self-driving. These may be hard to negotiate in the face of organized opposition from traditional transportation services and labor activists. Similarly, banking rules would need to be significantly changed to allow companies like Amazon or Google to provide consumer banking services – deposits, loans, credit, etc. – as part of their offerings. We believe that these types of barriers will erode with time. 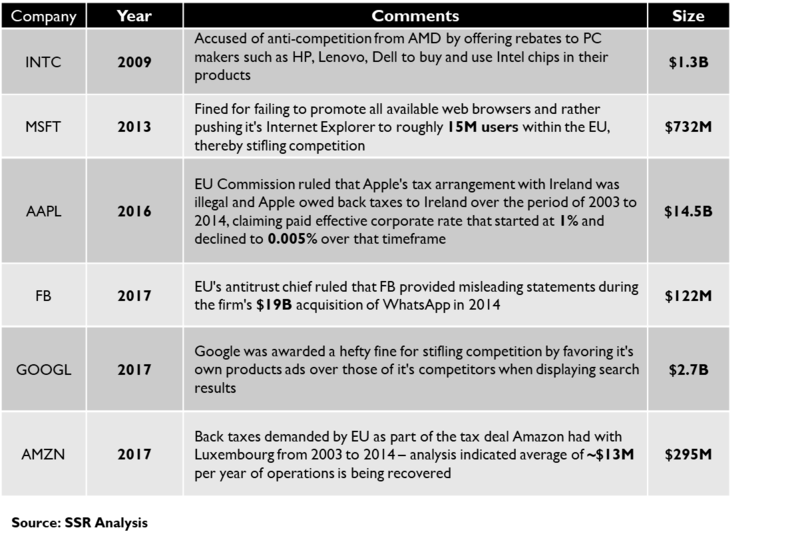 We have modeled the costs associated with likely government actions in Antitrust, Privacy, Patents and Taxation for Google, Facebook, Amazon, Apple, Microsoft and Qualcomm. Of these, we believe that European privacy regulations, which could stymie several categories of digital ads and slow the progress of AI-driven consumer services, have the greatest impact in the most likely scenario, although we believe the industry will find ways to convince consumers to opt-in to offer their data as a condition of service. Google – The EU has fined Google ~$2.7B for antitrust violations related to its treatment of its own Shopping citations within search results. Most experts believe that it will receive another fine, likely greater in magnitude, for its requirements that OEMS licensing its Android OS bundle several Google applications – e.g. Chrome, Search, Maps and YouTube – as a condition of access to the Google Play App Store. In addition, the EU has demanded that Google design and implement its own remedy to the unlawful search advertising policies, and would very likely demand a similar process if it indeed issues a condemnation of bundling in Android. The business cost of acceptable remedies is very difficult to estimate. Google’s proposed remedy for the Shopping search vertical – creating a separate shopping business unit which would work with retailers and then bid on an even basis with rivals for ad slots – would add costs to the process, but might not detract from the value of the ads themselves. Similarly, we believe most OEMs would continue to offer Google’s popular apps as native on their devices and that few users would opt to use alternatives – but unbundling opens the door to further OS fragmentation, which has been a competitive disadvantage vs. Apple’s tightly controlled iOS. In our most likely case, we hold Google responsible for $5.7B in fines, but do not add significant new costs for compliance or for the possibility of further antitrust activity (Exhibit 10). The EU’s GDPR privacy directive will also have significant costs for Google. European search and YouTube ads could no longer be targeted to specific users based on their revealed interests and demographic data without explicit permission from the user. This will make European ads less effective, yielding lower click throughs and thus, lower revenues. We have modeled this effect as peaking at 7% of expected European ad revenue in 2019, and declining thereafter, as Google works out new ways to target ads, develops new tools for tracking ad effectiveness, and implements an effective strategy for gaining user consent for capturing and using data. We do not expect that European policies will spread to new jurisdictions in our base case. Our model calculates the present value of the lost ad revenue at roughly $5.4B (Exhibit 11). Taxation is the final impact for Google. As it has with Apple and Amazon, we believe the EU will demand Google pay roughly $2.5B in taxes allegedly avoided by funneling much of its EU business through Ireland. As a further result, Google’s future European earnings and its realized tax rate are likely to be higher, a cost partly offset by the likelihood of lower US corporate tax rates. We calculate the total impact of tax changes at $3.6B (Exhibit 12). Thus, we believe that Google’s current valuation must account for a total of $14.8B in costs associated with expected government activity (Exhibit 13). Facebook – The EU has no open investigation of Facebook for antitrust, but the German Federal Cartel Office has begun an inquiry into whether the company uses its dominance of social networking to force its users into poorly understood and overly far reaching agreements to mine their demographic and usage data. This comes after the EU slapped Facebook with a $122M fine for misleading statements made during its review of the company’s acquisition of WhatsApp. Observers focused on the EU believe that the Competition Commission will wait for the activation of the GPDP before addressing privacy issues at Facebook, but could hint at strict crackdown on “small print” agreements. We are not including a fine for antitrust, but note that Facebook’s Messenger and WhatsApp dominate the European market for messaging, and despite agreeing to the merger, the recently militant Competition Commission could easily find reason (e.g. small print, bundling with the social network platforms, etc.) to open an inquiry. GDPR will clearly be significant for Facebook (Exhibit 14). We have modeled a more onerous hit to its European ad revenues given that the “Social Graph” used to target its ads is almost entirely built of data that will be directly affected by the new regulation, while Google’s targeting data is more mixed. Still, we believe that Facebook can craft an opt-in strategy to gain consent from most of its European users for the flagship social network and Instagram over time. Plans to monetize WhatsApp and Messenger may be more difficult to accomplish, given longstanding status as ad-free platforms. 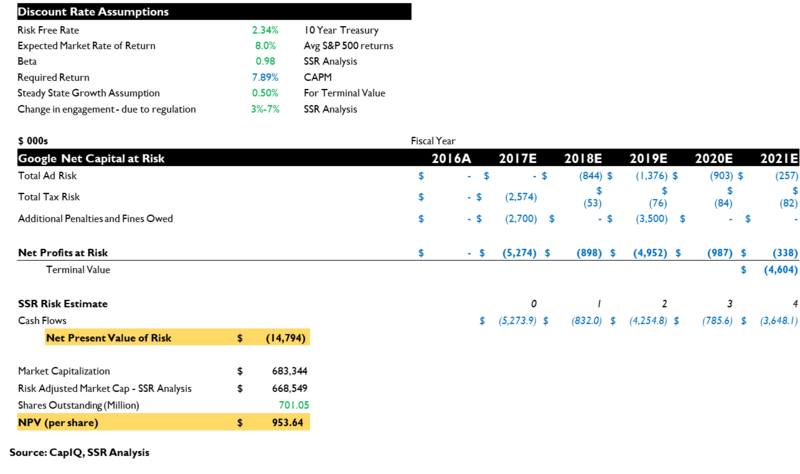 Our model calculates the present value of lost EU ad revenue at $6.9B. Like Google and Apple, Facebook funnels much of its European revenues through Ireland, reporting very little European profit and paying very little in taxes. We assume that the company will face a similar reckoning, with a substantial request for back taxes and higher realized rates going forward. The higher rates should be somewhat mitigated by a reduction in US tax rates. We are modeling a rise in the blended tax rate from the high teens into the low 20’s and a one-time payment of $3B (Exhibit 15). 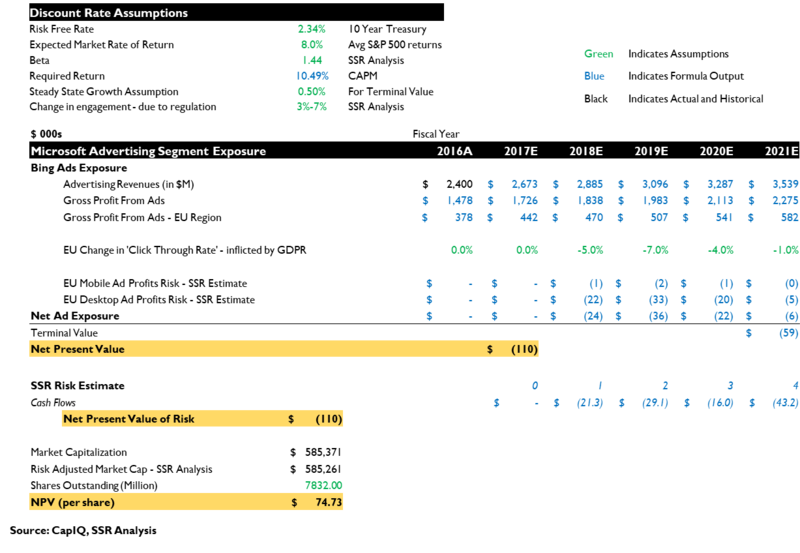 In total, the NPV of anticipated fines, reduced European ad sales, and higher taxes is $10B in our most likely scenario (Exhibit 16). Amazon – The EU recently dropped an antitrust inquiry into Amazon’s contracts for e-books after the company proposed changes to its business. This closes the most obvious vulnerability for Amazon from the EU Commission for Competition, as the organization seems to be defining retail distribution broadly enough to insulate the e-commerce leader from a formal investigation. Similarly, Amazon’s fledgling ad business and use of consumer data for product recommendations should be easily adapted to the GDPR opt-in requirements. We estimate this total cost at just $1.9B (Exhibit 17). Amazon’s tax bill will also be less burdensome – given its comparatively low margins, it already pays considerably less tax than its cloud platform peers. 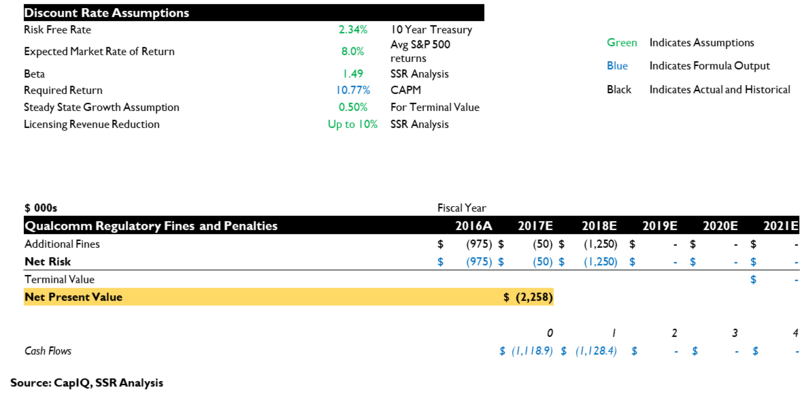 We expect it to pay its $295M penalty for back taxes in Europe, while perhaps even seeing a decline in its net tax obligations once US corporate tax cuts take effect. This could temper Amazon’s downside in the most likely case to a mere $2.1B (Exhibit 18). Apple – Despite Steve Jobs famous tirade against Android, one could argue that the rise of the Google-owned smartphone OS has been largely beneficial to Apple. Indeed, it is the existence of the alternative platform that protects the iOS ecosystem from antitrust. If the iPhone were dominant in Europe, there would be no question that its closed architecture – which denies competition to many of Apple’s default apps, charges 30% of revenues to software developers for access to their customers, and blocks development for compatible products – would be public enemy number one for the Commission for Competition. There is clearly risk that the EU will investigate Apple’s business practices anyway, but for now, the company seems safe on the anti-competitive business practices front (Exhibit 19). Apple’s vocal (and somewhat self-serving) advocacy for consumer privacy and data rights puts them on the EU’s side on GDPR, and positions it to benefit if the GDPR spawns even more stringent data laws in Europe or begins a contagion that spreads to other regions. The big downside for Apple is the $14.5B tax bill levied on it by the EU for underpaying via its Irish tax agreement. While we are skeptical that the European obligation will be significantly softened on appeal, Apple should be a prime beneficiary of US corporate tax reform. 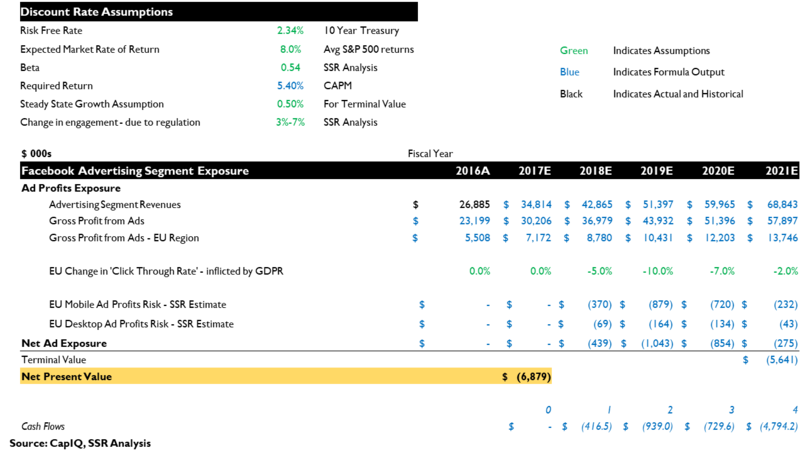 Current net taxes are about 25% of EBIT, rate that could drop a bit going forward. Given Apple’s $16B annual tax bill, a 150bp benefit could reduce payments by nearly $1B per year. In perpetuity, it would be more than enough to cover for the $14.5B (Exhibit 20, 21). A final note, Apple is hoping that its legal actions vs. Qualcomm will yield significant reductions in royalty payments for patents. Given the strength of Qualcomm’s patent holdings and its long, unbroken record of success in defending its licensing model in response to challenges from industry leaders in jurisdictions all over the world, we are skeptical that these moves will yield more than token benefit to Apple. Microsoft – The EU and US DoJ have already had their pound of Microsoft flesh in the decisions that mandated the separation of Windows from Internet Explorer nearly two decades ago. While Windows remains dominant for enterprise computing desktops, market changes, including the rise of smartphones and tablets, lower the perceived power wielded by Microsoft. We do not expect the EU to turn its attention to Windows or Office, and while Microsoft will need to adjust its Bing search platform to adhere to the new GDPR regulations, the impact on shareholder value will be minimal. Like the other big US tech firms, Microsoft has set up an Irish operating unit that reports most of the company’s European business and pays relatively low taxes. While we expect the EU to levy a similar judgment against Microsoft as it has against other firms, that impact will be largely offset by the likely reduction in US corporate rates. In total, we see the total government actions having a net present value of roughly $0.1B to shareholders (Exhibit 22). Qualcomm – The EU launched an antitrust examination against Qualcomm in late 2015, based on the complaint raised by British modem chip start up Icera, which had been acquired by Nvidia the previous year. The investigation accuses Qualcomm of strong-arming OEMs into exclusive contracts for its chips, using the leverage of its patent licensing program to seal deals. Qualcomm management has been long aware of the legal issues raised in tying chip deals to licensing demands, having faced similar accusations in the past, and unequivocally denies having done so in this case. Recently, the EU slapped Qualcomm with a $655K per day fine for failing to deliver requested legal documents on time, with the total believed to have accumulated to more than $50M since. Moreover, the EU is simultaneously considering Qualcomm’s proposed acquisition of European chip maker NXP, with the US company offering undisclosed adjustments to the deal in answer to the commission’s concerns. Given Qualcomm’s track record in defending itself in previous antitrust investigations, we have some confidence in the company’s ability to successfully appeal possibly negative outcomes from the EU inquiry. Still, with the daily fines mounting and the strong political stance taken by current Commission head Vestager, we expect a substantial fine forthcoming. We are assuming a $1.25B hit for 2018. We are also assuming that the EU eventually approves the deal for NXP – there is little product overlap that would fuel concerns for market power and Qualcomm can provide clear assurances that NXP’s IPR licensing will be held separate from the Qualcomm program. The biggest governmental concern for Qualcomm is the Apple led investigation of its intellectual property licensing model, underway in both the US and South Korea. At issue is Qualcomm’s 25-year practice of licensing all its patents in a single package for a single royalty rate charged against the wholesale price of the product using the IP. Historically, most companies have licensed IPR in separate buckets, with standards essential patents (subject to FRAND requirements) at lower rates than “utility” patents (often still vitally important to commercially viable products but NOT subject to FRAND). Qualcomm argues that all of its licensees use both standards essential and utility IP from its library of tens of thousands of patents, and separating out the licensing process would unnecessarily complicate the process of negotiating and enforcing its licenses, adding both cost and time. Moreover, Qualcomm’s licensing program has held up to multiple challenges in the US (Motorola, Broadcom, and others), the EU (Nokia, Ericsson, and others), China (Chinese NDRC), and South Korea (Samsung). We note the settlement with the Chinese antitrust authority, which issued a $975M fine but sanctioned long term IPR royalty terms applicable to all Chinese OEMs that preserved the Qualcomm licensing model at a modest discount from its historical terms (Exhibit 23). Meanwhile, we expect the stand-off with Apple will end a year or so from now with a terse press release announcing a royalty bearing cross licensing agreement with terms undisclosed – the endpoint to most of Qualcomm’s previous confrontations with high-profile licensees. In our view, Apple’s public indignation and legal provocation is an element in a negotiating strategy that is unlikely to win rate concessions to the degree that it is hoping. 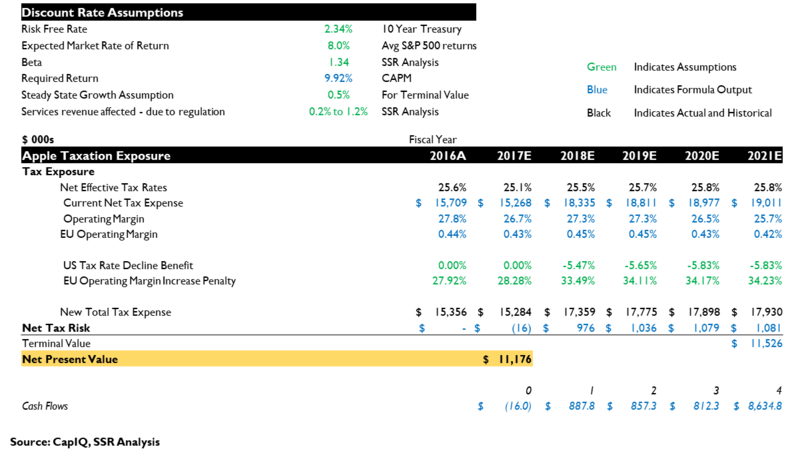 Qualcomm’s realized royalty rate – calculated by dividing its IPR revenues by the value of addressable devices sold – is a bit messy, as it contains one-time payments made at license signing and buries the effects of caps on the value to which the royalty is applied. (N.B. 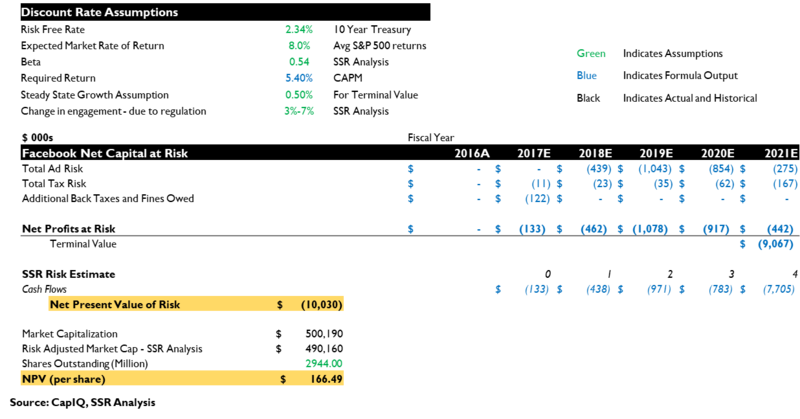 Qualcomm IPR contracts often only charge royalties on the value below a specific price limit). Recent calculations also embed Qualcomm’s struggle to collect from Chinese companies that had withheld payments pending renegotiations informed by the government’s investigation. This effect had Qualcomm’s overall collections more than 70bp lower than prior to the investigation. 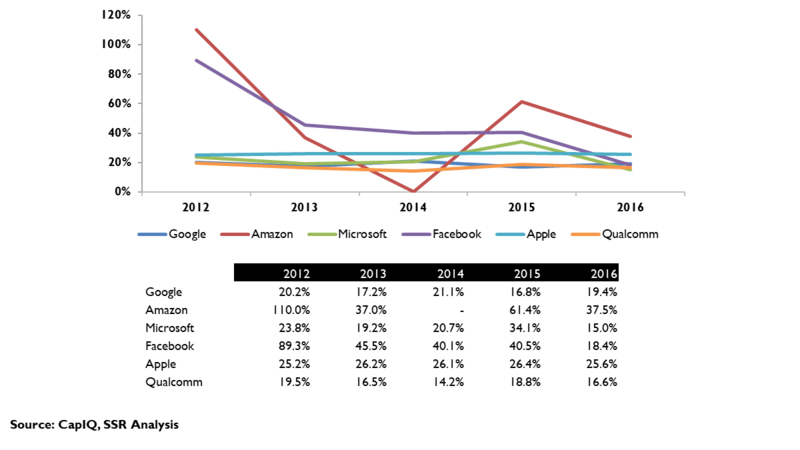 The most recent quarter saw collections fall precipitously, as Apple instructed its OEMs to withhold all payments on its products. In the long run, we expect the realized rate to rise to about 2.6%, reflecting a lower contractual rate but much more consistent compliance (Exhibit 24). We note that Qualcomm should also receive one-time payments for unpaid royalties by Chinese OEMs and Apple once negotiations are completed. 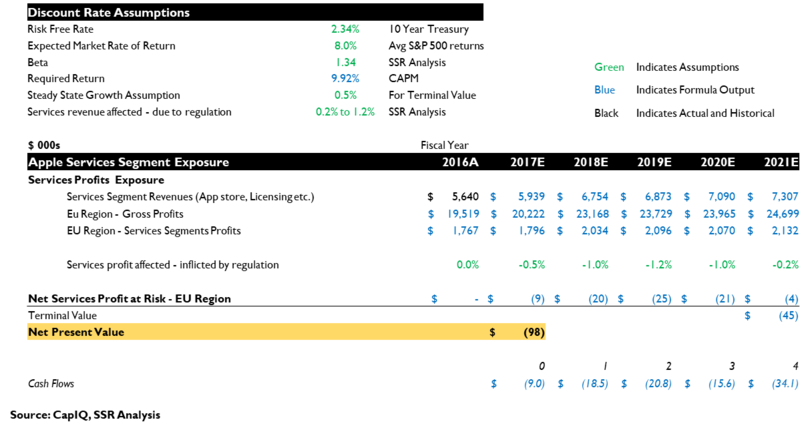 We believe that market expectations for Qualcomm are already embedding an unduly negative scenario for its licensing revenues. While our presumed rates are a roughly 17% reduction relative to long term historical rates, they are likely 25-30% higher than more pessimistic projections. Thus, while our model suggests a $7.9B cost of government actions for Qualcomm investors, we see this as a very favorable scenario given the current valuation (Exhibit 25). What’s the Worst It Could Be? While we believe that the most likely scenario of government action would result in minor costs for the major players in the Cloud/AI Era, the upper limit for the costs of government interference could be very high indeed (Exhibit 26). The EU’s Commission for Competition has the authority to fine companies as much as 10% of their annual sales for EACH instance of anticompetitive behavior that it fines, plus the same penalty for misuse of personal data under the GDPR. Moreover, a tightening of the rules could seriously impede the value of AI-powered virtual assistants, which will rely on usage and preference data to anticipate needs and recommend actions. Were such rules to spread outside of Europe, a possibility with growing distrust of on-line platforms and an uncertain political climate, progress on the consumer platforms that we have envisioned for the Cloud/AI Era would be seriously impinged. The effect on individual companies could be profound. We are assuming that antitrust regulators will grow to view the platform players – notably Google, Amazon, Facebook and Apple – as competing vigorously with one another, even if each has specific product franchises with dominant market share. An attack to sever Google’s powerful franchises (Search, Android, Chrome, YouTube, Maps, etc.) from one another, would dramatically reduce its ability to counter the other three leaders. Similarly, breaking up Amazon’s Prime bundle, opening Apple’s closed ecosystem, or separating Facebook’s archipelago of apps would seriously set back their ability to compete. Microsoft, having already lived through its DoJ consent decree, has less vulnerability to business model interference, but could see heightened opposition to possible future acquisitions to fill out its portfolio of Enterprise focused products or more stringent regulation of its potentially dominant cloud hosting business (an obvious risk for both Amazon and Google as well). For Qualcomm, 70% of its profits come from royalties and a government induced dramatic drop in rates could be catastrophic. We also note that the result of mass intervention would be painful for consumers as well. Integrated services would be disintegrated, becoming less intuitive and more cumbersome in the process. AI-powered services, including search, social networking, and AI assistants, would yield less appropriate content and answers. On-line shopping would be more expensive and less convenient. Indeed, the likely burden on consumers is the primary bulwark against overreaching government action against the leaders of the emerging Cloud/AI Era. Even in Europe, where the antitrust law focuses more on how market leaders hurt their would-be competitors than on its impact on consumers, the impact on end users cannot be avoided. The Germans, Spaniards, and Irish alike enjoy one-touch purchasing, intuitive search, easily launched apps, and other conveniences that could be rendered much less convenient by aggressive government actions. We do not think that the most likely scenarios for government intervention pose a significant threat to investors in the leading players for the Cloud/AI Era. We see the biggest threats for Google and Facebook, which will likely see weaker European ad demand and click through due to the new GDPR privacy regulations. However, we believe the legislation offers sufficient leeway for both companies to design compliant programs that could successfully gain the affirmative consent needed to return to personal ad targeting, even as targeting using other criteria could get more effective. For both, we see the all-in impact of government action (antitrust, privacy, patents, tax, and other) as less than $15B in NPV against their current market caps. 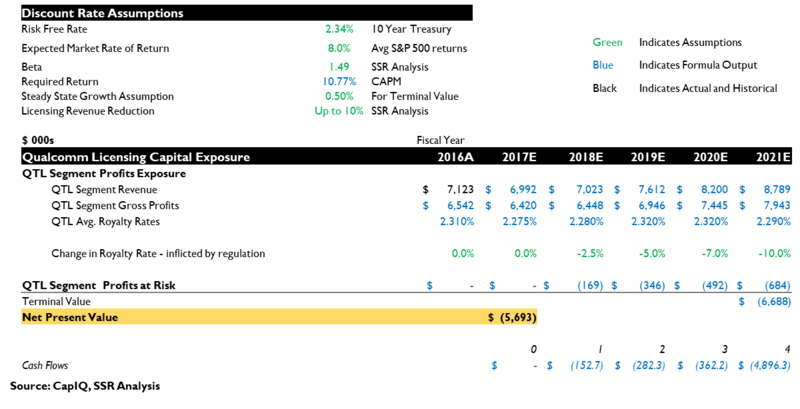 For Qualcomm, which we believe faces ~40bp in government facilitated declines in its realized royalty rates, the $7.9B NPV is a more substantial hit relative to its market cap, but one that we believe is already more than embedded in its share price. We believe that a positive resolution of its dispute with Apple is very likely and should yield significant and immediate relief to shareholders when it is eventually announced. For Apple, Amazon and Microsoft, the net benefits of a potential cut to US taxes should more than offset higher tax rates in Europe. Even with one-time hits from antitrust fines and back tax assessments in the EU, the cost to investors is unlikely to be significant.